While being back to school this week brought pangs of homesickness and longing for the days of my maternity leave with my sweet babe, I resolved to just allow those feelings to remind me to be thankful for that time. This week I began the process of merging the existence of my new little one with my “old life,” the one where I am a teacher, amongst other things. I was given many gifts and reminders throughout the week that helped me in the transition. -Upon seeing me open the 9th street doors to welcome my students for the new school day after my absence one of my girls happy clapped while kangaroo hopping into line. -Being greeted by 20+ smiles when they saw me at the door to our classroom. -Our sweet librarian telling me she missed hearing my footsteps climbing the stairs and rounding the hall the same time every morning. – Broden spending the day with his loving grandparents, and a Nana who made meals, did laundry and cleaned my house and did paperwork! -Playing Uno with students during indoor recess. -Two delayed openings, allowing me to spend more time listening to the coos of my baby boy and getting him dressed for the day (one of my fav parts of his morning routine!) as well as lots of sleep. -One of my boys approaching me during indoor recess (thank you sub zero wind chill!) asking to use the clear tape on my desk. After a few tries to use the scotch tape to attach his flashlight to his beanie he tried his flat brimmed baseball cap. After watching a few attempts with the flimsy tape, I signaled to him and we attached it with duck tape and he used his new “head lamp” to play the rest of recess. -Feeling good at this profession! Today is the first day of the new year and the last day of my maternity leave. My heart has been all kinds of anxious and fluttery today. I spent the day picking outfits for the week, making lunches, writing lesson plans, cleaning up the house, and removing Christmas decor clearing a way for the new normal thats about to start tomorrow, sprinkled with playing Mario Kart on our new Game Cube and of course being a mommy. The precious time spent in the hospital room as we began our first days together as a family of three feels like a lifetime ago. Those were some of my favorite days of my life; Cody, myself and our adorable new little nestled away from the outside world, only visited by family and friends, 100% taken care of and loved. I am a different person than I was seven or so weeks ago. I left school, all those days ago my figure round and full with the new life about to be born and work bag empty of responsibility (even of my laptop and emails!) I have spent the last weeks completely unburdened by anything other than learning to be a mother and I have cherished this time. The days were spent learning to breastfeed, snuggling, calming my crying babe, playing games, deepening old friendships and starting new ones, hanging out with family (especially with my own mother during weekly visits to help me transition into my new role), enjoying the holidays, and staring memorized into the face of my child; taking first steps into this new role called motherhood. Now, tomorrow, I head back into school, another step in developing my new normal. This time my belly is no longer round and full of the life that was once there and instead my school bag is loaded with fresh lessons and materials for the days of teaching ahead. My little one won’t be coming tomorrow with me and my heart weeps every-time at the thought. However, as I enter school, though my body is no longer physically full with my child, my heart certainly is. Full of memories of his first days spent together. Full of his expressions and the way his arms and legs never stop moving. Full of baby snuggles in lazy afternoons by the Christmas tree. Full of his big blue eyes and the o shape he makes with his mouth. Full of adorable baby clothes, soft skin and his rich, sweet scent. Full of sleep deprivation, baby cries and diapers. Full of tiny toes and long fingers. Full with the way he attacks my breast like a shark and clenches tiny fists while he nurses. Full of his recent coos and smiles. Full with watching my husband become a dad. Full of the excitement and joy of a life together with my baby boy. I am totally different than who I was seven weeks ago and my life is totally different. Tomorrow will be hard in ways I can’t even fathom today. Tomorrow will be difficult and sad and new, but it will also be wonderful and joyous and new, my heart more full of love as we discover normal life with this little guy a part of it! Author sarahemeassickPosted on January 2, 2018 January 2, 2018 Categories UncategorizedLeave a comment on Full. Welcome to the world Broden Andrew Meassick! Here I sit on the couch in our little place on Gettysburg Pike one month after your birth. You are snuggled up under my chin after feeding, staring up at me with your wide eyes. You’re laying snug against my chest, arms relaxed and body flat against mine. I imagine you laying just so (except inverted 🙂 in my womb just a few short weeks ago. I love cuddling with you this way, your quiet breath and relaxed arms bringing me contentment, wanting to stay here with you in this moment forever. I am so in love with you and with who you will be and I’m so excited to keep discovering that with each new day of your life. You were born November 18, 2017 at 7:03 am (the time the same as our wedding anniversary date)! You were 7 lbs and 6 oz and 20.5 inches long, though Daddy said you may have lost a whole pound from the first poop. You didn’t come the way I wanted or planned but despite it all I’m just so glad you came. On Thursday night, November 16th, after a long week of waiting and waiting, going on walks, doing squats, eating pineapple and just about anything I could think of to get you here, it came to the point where I had to give up my dreams and hopes of having you come on your own. I was sad. I had to grieve not getting to have the surprise I wanted, having my water burst in the middle of the night or in my classroom, and making frantic phone calls to family as we sped to the hospital. It wasn’t going to happen that way. Instead, I sat grouchily on the couch and your dad convinced me to go on a date that night before we began the process of bringing you into the world. We drove to a hipster little cinema in Harrisburg, purchased tickets to the movie “Marshall” and had dinner at our little crepe place where we sat in the window and drew pictures on the chalkboard tables, as we had done for my first birthday together a few years before, doodling bears and dreaming of you. We got a parking ticket and laughed it off as we ventured back to the theatre. As we sat in our seats watching the movie and I could still feel you bumping around my belly knowing these would be some of the last times I felt you inside of me. On our drive home, I began to panic and second-guess our decision to induce. I got into a long-winded “discussion” with your grandma but your dad came to the rescue with a whiteboard marker listing the pros and cons of inducing on my bedroom mirror. I’m so thankful he is level-headed and decisive, and one of the best pros he listed was getting to play with you sooner. The night ended with a phone call to my parents reconciling from our “discussion” and a short night of sleep. We woke up and got ready and began the drive to the hospital. Your dad listened to pump up rap music in his Friday Hawaiian shirt, the same shirt he wore when he got punched in the face by a student not too many weeks ago, hoping to make new, good memories to redeem the shirt. I texted friends and family and cried some silent tears as I grieved not sending the messages in the way I had wanted. We parked our car at Hershey Medical Center and wandered hospital halls looking for the lion that would signal we were in the right spot. Finally, we were directed to the elevators and rode the three stories up to check in at labor and delivery. We got settled in the room and met our nurse Sarah Elizabeth. Cody made jokes about the heating light in the room and about wanting to get out of here in 12 hours, both of us thinking that would be the longest it would take. To my horror the nurse said it would take 1-3 days for the average induction and I panicked. This is not what I planned and I wanted to get out!! After seeing my tears, the nurse softened and encouraged me that I was making the right decision. We told our families it could be awhile but they were so excited to meet you they came to wait anyway! I was only dilated a little bit and after coloring with your grandma and rocking in a rocking chair between painful contractions, and after 10 hours of labor I got to the point where they gave me a little medicine to get things going. I was glad that it was working naturally given the little push. My nurses and doctors were sweet and I loved telling them how much I respected them because my best friend Taylor was a nurse. The second one gave me a big hug and she ended up getting to see you later that weekend. That night at 7 pm my third nurse Kaitlin came. She was very calm and helpful, especially cleaning up “aisle 7” as I like to call it. Giving birth is messy business. As the night pressed on, I got pain medicine and I got an hour of rest through the contractions as I lay on my side holding hands with your dad, I would sleep for about a minute and a half and then wake to endure the 30 second contraction that came like clock-work. The second painful hour came from 2-3 am as I bounced on an exercise ball and talked to your grandma. At 3 I decided it was time for an epidural. I folded my body over, my hair in a mess underneath the hair net. The resident doctor “missed the spot” and the attending physician had to fix the mistake, telling me he was just rubbing my back as he inserted another needle. I got about an hour relief after that, but soon I was in a lot of pain again. It would be time to push very soon. I squeezed your dad’s hand through the pressure of each contraction and an oxygen mask was placed over my face. About 22 hours after being in the hospital, there was a flurry of doctors in my room. They could not get a read on your heart rate and it seemed to be dropping with every contraction. My parents were shuffled out and doctors began talking about a C-section, something I knew was a faint possibility but never expecting it to happen to me. I frantically agreed, wanting to do whatever we needed to do to get you out safely. They began prepping me for surgery and gave your daddy a hospital gown. Somehow he remained calm and made jokes with the nurses about how to put it on. I remember feeling terrified as they disconnected the belly monitor where I could hear your heartbeat, my lifeline to knowing you were all right. They bumped me down the hall on the bed to the surgery room. The anesthesiologist put medicine in my epidural but it only began to work after two more doses. The tent was put up and your dad was ushered back in the room and he sat next to me. I asked him if everything was going to be okay and he said he didn’t know. We looked at one another trying to assure each other and ourselves that no matter what everything would be okay, but we couldn’t stand the thought of going home without you. I thought I heard a noise like a flat-lined heart rate monitor so I didn’t understand why the doctors worked so calmly. I lay there paralyzed, unmoving, like a deer-in-headlights, not sure how to feel as I hoped and prayed to hear your cry. It felt like the longest 15 minutes of my life but eventually I could feel the resident doctor attempting to pull you out. I could feel the pressure of your head trying to break the suction. One, two, three! You were out! We heard the sound we were waiting for, longing for: your cry, and I breathed a sigh of relief. They cleaned you off a little. took your height and weight and your dad brought you over for me to see. The first baby he ever held was you! He took our first family photo, a selfie of me on the operating table and you in his arms. Eventually he was brought to the recovery room and I drifted in and out of sleep, listening to the doctors talk about Thanksgiving plans as I was stitched back up. When they were finished, a kind nurse ran my hand gently over my flat tummy, a feeling I hadn’t felt in many months. You actually were no longer inside of me. I was wheeled to the recovery room where your dad waited with you. They asked if I wanted to hold you but after 22 hours of labor and a C-section I was trembling so severely that I said no for fear of shaking so bad I might drop you. My dearest Broden, I held the evidence of your unexepected life on a small plastic stick on March 6, 2016. I held you inside my body for 9 months (plus 10 unexpected extra days), and on November 18th, after a unexpected induction and unexpected C-section, my trembling stopped I held you in my arms. I held you then for the first time and I will continue to hold you in my arms until you get so big that I’m not strong enough to carry you any longer. Even then I will continue to hold you, through the expected and unexpected, in my heart for the rest of my life, my son. I love you more than I understand right now. Even now I still can’t believe you are my baby and that we are a family of three. It is my prayer that you grow knowing my unconditional love and the unconditional love of the One who knit you together in my womb. It is Advent now, the time leading up to Christmas and we celebrate the unexpected way a baby, the Messiah entered our world. This season I am constantly thinking of Luke 2:19, “Mary treasured up all these things and pondered them in her heart.” That’s how I feel about you Broden, and this last month, I have treasured up all these things: all the moments, memories, visits from friends, facial expressions, cries, features, the way you squirm around, them too joyfully unexpected and ponder them, and store them forever in my heart and I thank God once again for the unexpected because it is the way you too have come into the world. I love you my Broden Bear! Author sarahemeassickPosted on December 18, 2017 December 19, 2017 Categories Uncategorized2 Comments on Welcome to the World! Here I sit, on the eve of my first baby’s due date just having savored perhaps one of my last uninterrupted showers for a long time (as suggested by a co-worker and mother of two boys!). I finally feel ready, like this little guy can come and we don’t have many more boxes left to cross off. We are ready. I didn’t know if I would get to this place. I didn’t know if I would’ve had this moment. Our little guy could’ve chosen to come an hour ago, yesterday, or even last week! What matters more than “being ready” is the deeper trust that has been growing in my heart as I’ve wondered when my baby would come in these moments of waiting, in those moments of not knowing! Should this little guy have made an appearance last week, or the month before, despite our to-do lists we would have been ready. These last weeks have taught me a lot about trust. Trusting that even if the new little baby clothes weren’t put into neatly sorted drawer organizers, even if diapers had not been laid out on the changing table, even if books were not sorted onto the shelves, even if I hadn’t had a chance to make the last SMART boards or lesson plans, even if adapted spelling tests were not sorted into color coded folders, and so on everything would’ve been okay. Like freshly fallen snow that quiets the world stopping everyone in their tracks from continuing to perform and do and go to work, so does the arrival of this new bundle of joy into the world. If he had decided to come last week or even the week before, our world would have had to stop, and it would’ve have had to be okay. And, I (we!) would have been okay! These last weeks have taught me to stretch out new trust muscles towards my Heavenly Father much like our little guy will soon stretch his tiny hands and feet in the days to come accepting that even I (and my baby, my family, my student, my long-term sub) will be okay without one more thing checked off the to-do list. Trusting, trusting that the One who holds the galaxy in His hands, holds me and those all around me and knows just the right moment for this new life to enter our worlds. Can’t wait to meet you baby boy, ready or not, trusting, trusting! Just 8 days away from my due date and I’m definitely getting “baby brain.” It’s hard to go full throttle into each day in second grade while anticipating such a big change for my family at home. After a slow, humdrum morning in reading it was great to celebrate the holiday with my annual “Pumpkin Day” activity and dive into my last moments with my class before I go on maternity leave. I started the day with three brightly colored pumpkins on our classroom counter. Students oooed and ahhed when they came in and at morning meeting I began reading the story. We made and recorded hypotheses about which pumpkin would have the most seeds; the big, the medium or the small. During my prep time, I cut round circles around the tops of each of the pumpkins and lay them out on black butcher paper. Next to each one, I put one plate labeled “seeds” and one labeled “pulp.” When the students came in from gym, we mirrored the activities of the characters from the story and began the job of counting our seeds. After assigning groups the children got to work, some timidly shying away from the slimy, stringy pumpkins guts and others jumping right in hands full of muck. They separated seeds from pulp, washed their hands and recorded their observations in their science notebooks. The pulp was cleared away and the students made piles of ten on the paper to begin the counting process. When the piles were complete, we walked to each group and counted, and students were challenged to count past each new hundred, 10, 20, 30, 40…100, 110…200, 210, 220…300, 310, 320, 330…400, 410, 420, 430, 440…500! The day ended, a swirl of black paper, seeds, empty pumpkins, ghost lollipop treats, and noisy children. After school, I graded science notebooks (a small loose end to tie up in preparation for my long-term sub) and I was delighted to find pages of hard work in science all trimester cultivating in this fun “Pumpkin Day” investigation. In the daily moments of repeating directions, making up missed work, reteaching center activities, and reminding students to put a punctuation mark or a capital letter, I got to feel proud! Proud of students for doing great work and proud of myself for doing great work too! 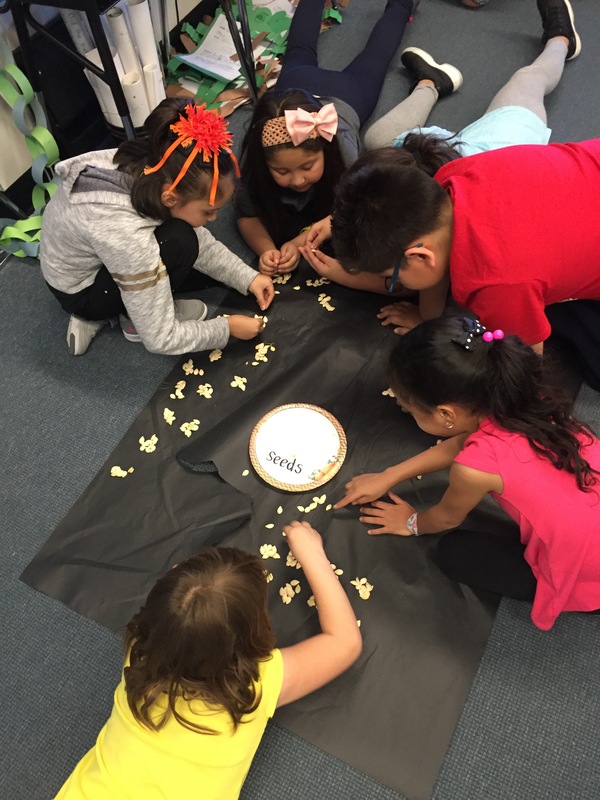 Though it may seem a small dent in the face of poverty and underperformance, I was reminded that I am filling my classroom with a sense of joy, belonging, curiosity and excitement where there is room to simply wonder; How Many Seeds in a Pumpkin? Author sarahemeassickPosted on October 31, 2017 October 31, 2017 Categories Uncategorized1 Comment on How Many Seeds in a Pumpkin? A few small things I love about today (even on a mostly crabby and grouchy day). 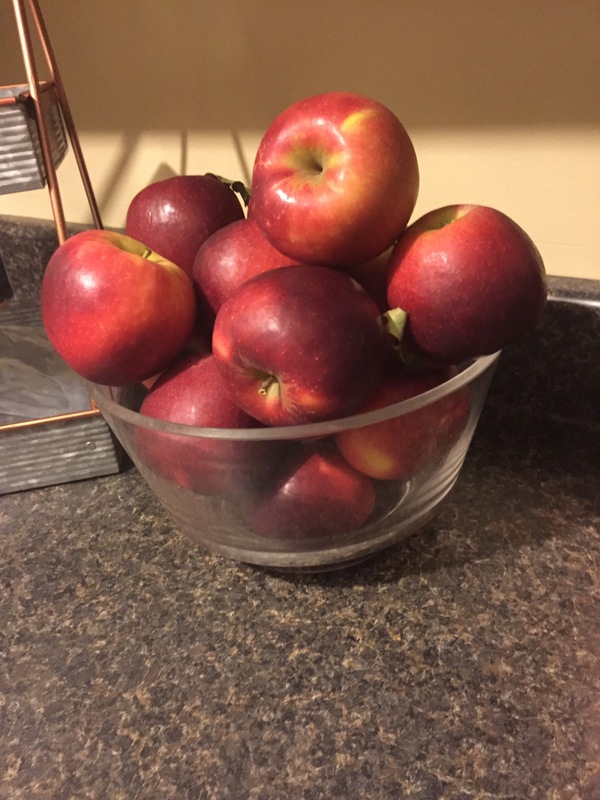 I love the bowl of apples in my kitchen. I love the ripple of a hand, a foot a bottom or whatever part I can see move across my belly. I love the new journal and frappacino coupon I got at Barnes and Noble. I love the scent of my pumpkin-apple candle. I love my husband who willingly helped tidy our house before his trip so I came home to a peaceful place of rest this evening. I love that when one of my goofy little second grade boys was caught sitting in my teacher chair, we both shared a laugh as I playfully reprimanded him instead of bursting with actual frustration. I love playing “silent Simon Says” in the hallway before music class, making up silly motions to capture the giggles of a bunch of 8 year olds. I love the furiosity of focus from both my line leader and another student to earn their line up points. I love the silent intensity with which 20 something pencils pop into the air after Rocket Math. I love listening to predictions and wonderings as we read Superkids or Frog and Toad. While so much of me was so wearied by what not to like about today, I am reminded of a few small things to love. Score cards from 10 mini-golf courses! Three summers ago, I spent a month on the island working at Harvey Cedars Bible Conference and with the help of several of my beach friends, I crossed off my first LBI bucket list item: biking the entire 36-mile round trip to the southern tip of Holgate all the way north to Barnegat Light and back again returning back to the conference center. We bike to every place. Course #1&2: Mr. Tee’s. (See above) At Mr. Tees we played in our first mini-golf tournament and we were not disappointed. 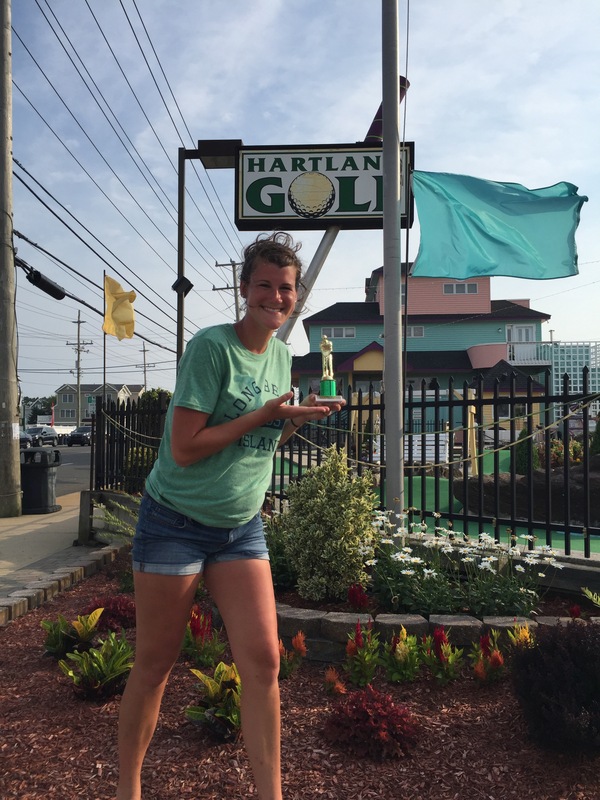 After slaying the first 9 holes, I choked on the second 9 but still enjoyed the competition and meeting some other avid LBI mini-golfers. (We will definitely be participating in a tournament again next year!). After the tournament round, we played the shorter holes behind the tournament course completing the first 36 holes of golf. Course #3: Mr Tee’s 36 Hole Course. (See below) At our second stop, we were joined by my mom and Josh to play the 36-hole course in the hot noon-day sun. I loved the small size of each hole (except for the longest mini-golf hole which ran a narrow stretch along the side of the ground’s maintenance building) and did very well. Cody on the other hand, was not too pleased with his performance, and when his bike pedal broke off as we were leaving, he had to walk to the next course while we waited for a different bike. This definitely did not help! Course #4: The Sand Trap. (See right) We quickly breezed through this course (having played it just a few nights prior for Cody’s birthday) and I came out on top, putting me at 3-1 for courses, much to both of our surprise. Course # 5: Island Golf. (See below) Making it past the causeway (that marks the half-way point up the island) we stopped at Island Mini-Golf and the tides began to turn, both in Cody’s playing and his enjoyment of the day. Course # 7: Flamingo Golf. (See below) At this mini-golf course, Cody and I racked up lots of holes-in-ones. The groundskeeper here prided himself in the upkeep and precision of each holes’ contraptions. We loved that if you scored it in the windmill’s bucket or hit right into the “nitro-blaster-thing” your ball would roll into the hole every time! This man also gave us the best ball selection; I played with an emoji and Cody with a golf version of an 8 ball. (See right) No wonder this is the favorite of LBI mini-golf enthusiast, Ray Romano. (Side Note: You may have noticed that I changed my shirt. 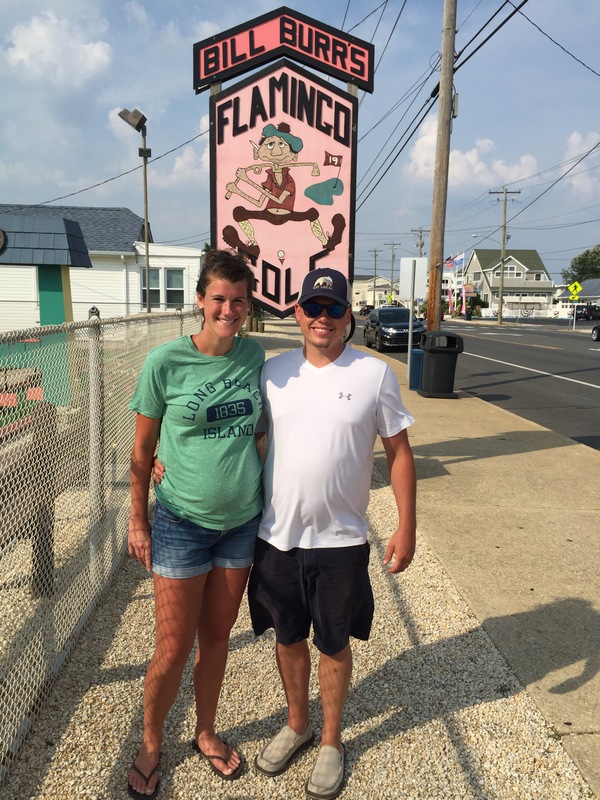 This day was a scorcher and Cody and I had to stop for iced coffee and lemonade before running to the Surf City 5 & 10 to buy a tee-shirt with sleeves so that I would not continue to get fried). After Hartland, Cody and I biked over seven miles against the ocean breeze back home for dinner (Now it was my turn to be grumpy, 5 month pregnant legs were not thrilled and I now understand why it’s better to be the goose flying in the back of the V). I constantly had Cody go in front of me to face the brunt of the wind. After dinner, we were back out to our most familiar mini-golf hotspot for the last two courses. Courses # 9 &10: Thundering Surf. (See above) We finished up our day with the Waterfall and Cave CourseS at Thundering Surf in Bay Village. The holes are the most popular, yet most difficult and haphazard on the island (to my demise). Cody, completely decked out in golf attire, garnished many the odd-look and stare, but came out glaringly on top in our competition. He ended up with all five points and secured the title Island Mini-Golf Champion, after I had put up a good fight all day long. We both were champions having completed such a long and strenuous yet fun day! 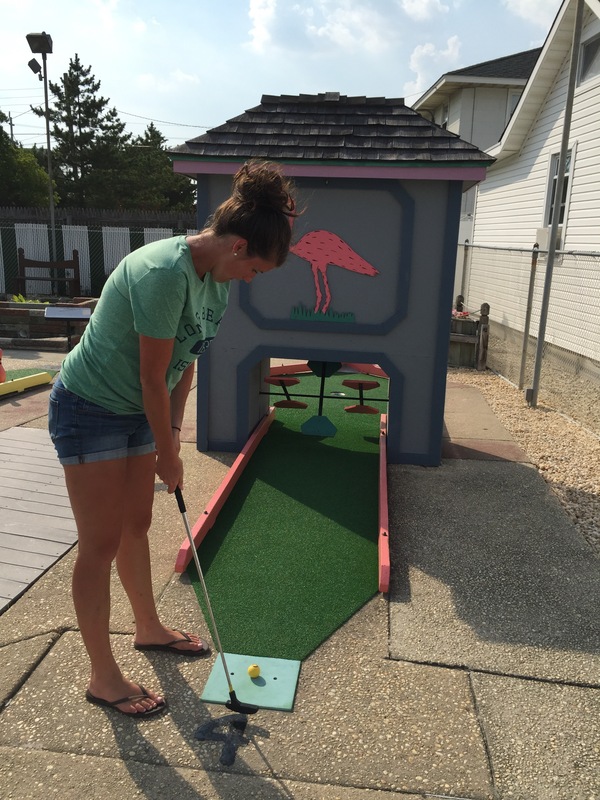 Our day, which began at 9 am finally ended at 11pm, but we were successful at playing all 198 holes of mini-golf on Long Beach Island!! It was a day on my precious stretch of shoreline that I will never forget. And despite both of us having our moments, whether from near heat-exhaustion or the competition of the day, I’m so glad to have a partner in this life that’s as quirky and up for this kind of silly-fun! It was a day for the Long Beach island memory books!